The swabs are commonly used for the personal hygiene of the ears in order to remove the possible earwax that is built up inside them. However, when using them you need to be very careful not to harm the ears. Earwax is the yellow substance that occurs in our ears and serves to protect them. Earwax has antibacterial properties that can protect eardrums of dirt, dust, bacteria and from water.When you are using cotton swabs you are pushing the earwax deeper into the ears. Earwax cleans your ear canal, but when you are using cotton swabs, they take the bacteria and fungus to the inner parts of the ear, which can lead to serious infections and pain.When you use cotton swabs to clean your ears, you actually initiate a process of scratching and itching. The more you swab your ears to clean them properly, the more itching you feel. • You should use the swab only for the cleaning of the outer part of the ear and the area around the ear canal. 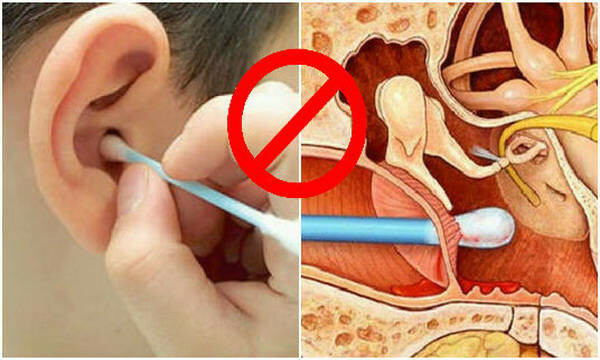 • Don’t use the cotton swab deeper in the ear because you will push the earwax to the bottom and could plug the ear. This could cause hearing problems and dizziness. • For the children, there are swabs specially designed for preventing intrusion into the ear canal. Now that you know the dangerous consequences of using swabs, you may wish to know the other options for cleaning your ears. One option to clean the earwax from your ears is to make a mix of 1 part each of rubbing alcohol, white vinegar and tap water and to add a few drops in your ear. Another option is to put a few drops of olive oil in your ear. It will soften the earwax and make it easier to come out.